@ www.vyapam.nic.in. 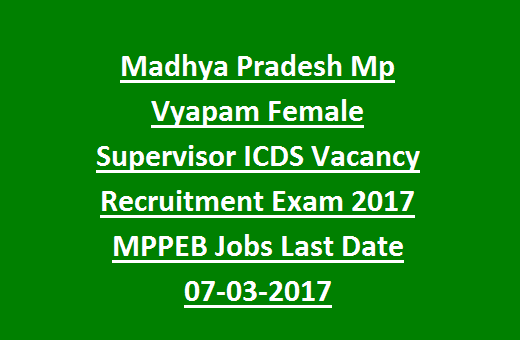 This MP Vyapam Supervisor Recruitment 2017 is only for the female candidates who are having eligible qualifications. Aspirants can get the Mp Vyapam Female Supervisor Notification 2017 from the given link below or go to www.vyapam.nic.in. The Madhya Pradesh State government has issued the MP VYAPAM FEMALE Supervisor, Anganwadi Karykartha Supervisor Jobs of ICDS Recruitment 2017 notification to fill available vacancies. 714 vacant posts are going to fill through this MP Vyapam Supervisor ICDS Recruitment 2017. This is very rare opportunity to get a job in MP ICDS Recruitment as a Supervisor post in government sector. If you are interested and you have the eligibility, then you can apply online now for MP Vyapam Supervisor Jobs Vacancies through www.mpvyapam.nic.in. Online Registration for MPPEB Mahila ICDS Supervisor Jobs Recruitment 2017 will be closed on 07-03-2017. Online application for MP Vyapam Supervisor Jobs will be start from 21-02-2017. For more information about MP Vyapam ICDS Anganwadi Female Supervisor Jobs please see the below given information. Supervisor Exam Dates 25, 26 March 2017. ICDS department of Madhya Pradesh currently having 714 vacancies which are going to recruit through MP Vyapam. As on 06-03-2017 for MP Vyapam Female Supervisor ICDA Recruitment 2017 upper age limit for Madhya Pradesh State female candidates is 45 years and for other states candidates upper age limit is 35 years. For Mp Vyapam Female Anganwadi Supervisor ICDS Recruitment 2017 candidate must have qualified bachelors degree from a recognized university. For Female Anganwadi Supervisor Karyakarta Posts-candidates must have passed 12th class and should have at least 5 years experience of Anganwadi Worker. Madhya Pradesh Professional Examination Board will conduct written examination for this Supervisor jobs of MP ICDS. There is no interview will conducted for these vacancies. For complete information about recruitment process you can visit official website of MPPEB www.vyapam.nic.in. Application fee for MP VYAPAM FEMALE Supervisor ICDS Recruitment 2017 is Rs.500/- for single post and Rs.250 for reserved candidates. MPPEB will conduct the written exam for 200 marks. Total 200 questions will be given for each question one mark will be allotted. Exam duration is 3 hours. Question paper will be available in English and Hindi Languages. Written test for MP Vyapam Supervisor Jobs will be held in 25/26-03-2017. So download Exam Syllabus Pdf Hindi me abhi and start preparation. Candidates can apply online through MP PEB official website on or before 07-03-2017. Fill all the necessary information and pat the application fee and then submit the application after uploading passport size photo and signature scanned copies. Before applying read the official notification. After submission of application take a printout and keep it with you for future reference.